The winter months can leave us feeling pretty lethargic. And that can easily lead to wintertime weight gain. But thankfully, making just a few small changes in your daily habits can lead to rapid and noticeable weight loss, which will leave you feeling confident and happy throughout this season. 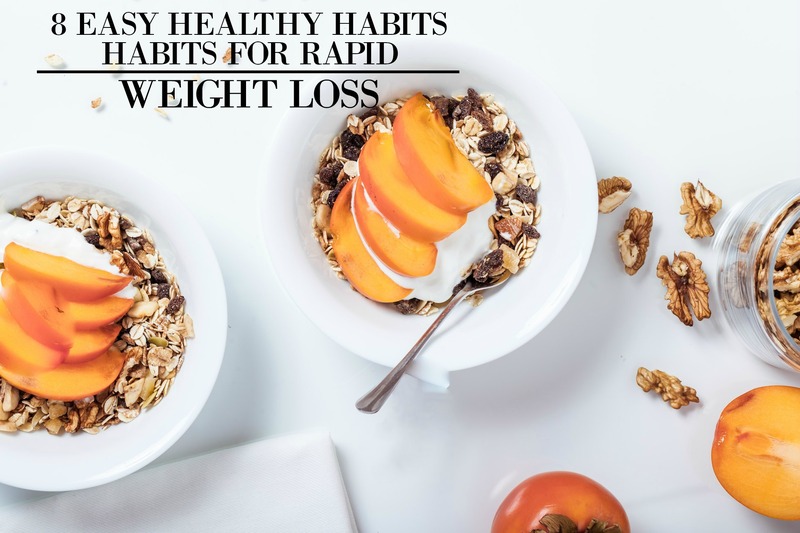 So if you want to find some simple ways to make weight loss easier, then apply some of these habits and you’ll start to see change in your body and change in how you feel internally. The average human body is 50-65% water, so it stands to reason that we should be staying hydrated. An increase in water consumption not only helps to increase the number of calories burned, but it can also help us feel fuller before eating a meal. This, in turn, results in consuming less calories through food which has been shown to increase weight loss significantly. Write down absolutely everything you eat in a food journal. The habit of writing every calorie down not only helps you get an idea of exactly how much you are consuming in a day, but it also influences your decisions in the moment. If you find yourself about to consume a sugary soda, writing the calories down may help you consider a sparkling flavored water instead. After just one week of rigorous food journaling, you are far more likely to see positive results in changes in your eating habits. Simple carbohydrates like those found in potatoes, cookies, and other sugary foods sneak their way into unexpected foods such as ketchup, yogurt, and even sugar-free cookies! Cutting carbs from your diet can lead to immediate fat burning. Without having to process the extra calories caused by simple carbs, your body can shift the focus to burning fat. Adding more protein to your diet, especially at breakfast time, can help dramatically with weight loss. Protein leaves your body feeling fuller longer, and you require more energy to digest protein than other foods, meaning you burn more calories processing protein than you would with carbs or fat. Meal prep may sound intimidating but planning just one meal a day can lead to drastic weight loss. Spend one evening at the beginning of the week preparing your lunch for every work day. This not only allows you to know exactly what is going into your food but can help you pack your calories accordingly. Plan protein rich chicken dishes with plenty of fresh veggies to leave you feeling full until dinner time. Having complete control over every calorie in your lunch will empower you to make better meal decisions throughout the day. There are many benefits to getting plenty of sleep, and weight loss is among them! A lack of sleep can lead to poor decision making the next day. You might be tempted to fall back into old eating habits as opposed to planning your meals and counting your calories. Lack of sleep can also lead to a slower metabolism resulting in fewer calories burned. Be sure to get the recommended eight hours of sleep every night to wake up feeling refreshed and ready to stick to your healthy habits for weight loss! The practice of mindfulness involves being fully aware of what is happening in and around us. It is easy to lose track of what or how much you ate if you are mindlessly snacking while watching Netflix. Instead, plan to have your meals at a table with no distractions. Focus your mind on each bite and take a good amount of time to chew and swallow. Studies are finding that this mindful approach to eating helps us keep track of what is going into our bodies which in turn makes it easier to keep track of when and how much we eat. Probiotics are live bacteria in the stomach that have been proven to help digestive health, and it has been suggested that probiotics help with fat burning and weight loss as well. If your diet was previously high in fat and sugar, then there is a chance that the bacteria in your stomach have been altered which can lead to the good bacteria deteriorating. While many foods, like kimchi and yogurt, are high in probiotics, there are also over the counter supplements available to help get your stomach bacteria balanced again. Losing weight isn’t always the easiest, especially during the colder months when we’re getting comfort food cravings. But with just a few simple habits and hacks, it’s definitely doable! So whether you want to shed a few pounds or see a dramatic change in your weight, these tips will seriously help you get there.